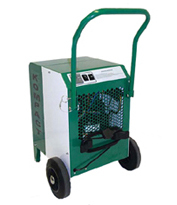 Hire the Ebac Konpact refrigerant dehumidifier capable of extracting between 18 - 20 Litres of moisture per day @ saturation. The Ebac is no-nonsense, go-anywhere, portable dehumidifier. Rugged enough for industry shops and store rooms, efficient enough to dry sensitive computer centres or archival storage.